Would you like some cookie with your M&M’s? When it comes to monster cookies, I like mine loaded with M&M’s and chocolate chips. What’s the point of having a monster cookie any other way? Go ahead and buy a big bag of M&M’s for this recipe. I used turbinado sugar (sugar in the raw) instead of brown sugar. You can substitute brown sugar, but they may turn out different than my batch. Since oven temperatures can vary, watch the cookies closely to avoid over-baking. These took about 9 minutes to bake in my oven. In a large mixing bowl, cream butter, sugar, and peanut butter using an electric mixer. Mix until light and fluffy. Mix in egg and vanilla. Combine dry ingredients in a separate bowl. Gradually mix wet and dry ingredients together. 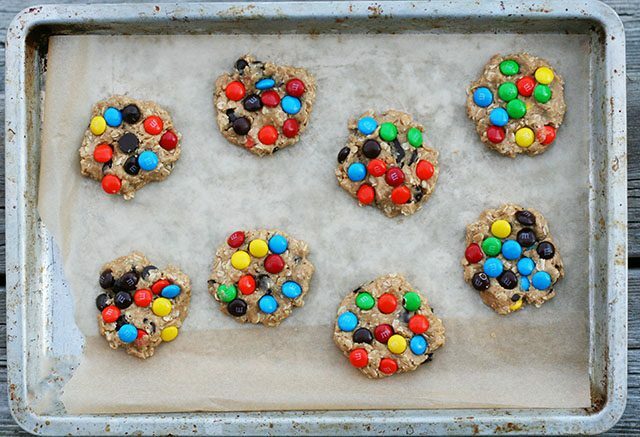 Add oats, chocolate chips, and about half of the M&M's. Take a golf ball sized amount of dough and roll into a ball. Place on baking sheet and flatten with hand. You'll get about 8 cookies per pan. Top each cookie with 10 or so M&M's. Bake for approximately 9 minutes, until the edges are golden brown and center is barely set. Remove from oven and allow to cool for a few minutes before transferring to a cooling rack. These cookies just looks amazing and the m&m’s for the decoration are perfect.